Taking care of a hamster might seem overwhelming because they are such tiny creatures and you might not be certain about what you will need to care for them. Hamsters can live up to 3 years with proper care, so it is vital that you help them to feel as happy and at home as possible. We have compiled a collection of tips for caring for hamsters, signs of a healthy vs. unhealthy hamster, as well as some of the best hamster care products available on the market. Some people choose to buy more than one hamster at a time to help keep them entertained and ensure they will not be lonely, but it is important to consider the type of hamster. For instance, Syrian hamsters should never be paired together, as they will fight violently to defend their territory. Dwarf hamsters, Russian or Chinese hamsters can be very territorial creatures, but they tend to do well in pairs if they are littermates or mother and child. Consult your veterinarian or pet store associate for tips on housing hamsters. A good rule of thumb regarding this topic is to keep hamsters separated in different cages, even if you are purchasing two at the same time. This will ensure they have their own space and are not tempted to get violent to defend their homes. It might seem like a lot of work to maintain separate cages, but it is for the best for the wellbeing of the hamsters. Another thing to consider before purchasing a hamster is who will be the primary caregiver for it. Hamsters are not the best pets for small children, as they are very small, require large amounts of care, and can bite if they are frightened. If a small child is going to be handling the hamster, make sure you always supervise them and do not allow them to clean the cage or reach into the cage suddenly, as this may frighten the hamster. This is especially important for smaller hamsters, as a small child might get scared if the hamster nips at them and could drop it, leading to the hamster running away. Do not underestimate how fast a hamster can run, as they practice their running endurance on a daily basis, and it can be very tricky to catch them once they hit the ground running. When you first bring your hamster home, you will want to ensure that they have a pleasant and calm experience. Hamsters can become easily stressed, so it is vital that you help them to feel calm, especially when they are being brought to a new environment. It is essential that you have a tank with a solid bottom, as hamsters love to chew on things. You can also line the tank with sprinklings of aspen, pine, or recycled paper to provide more comfort in their new home. You can ask the pet store if you can take a small amount of the shavings from the hamster’s previous tank to add to their new home, so they will feel more comfortable. Hamsters love exercise, as they have a lot of energy, so it is important to provide them with an exercise wheel inside their home. You can also get them a hamster ball to run around in, so they can cover more ground and run around your home without getting loose. Always be sure to supervise your hamster when they are running around in their ball and that you secure the ball tightly before letting them run, as you want to be sure that the ball does not open after long periods of them running in it. Hamsters are excellent at keeping themselves clean – from their ears to their faces and fur, so there is no need to wash them with any additional methods. If they do happen to get dirty from running around in their ball outside or from other activities, you can gently spot clean them with a wet washcloth or unscented baby wipes. If you own a hairless hamster, you might consider using a small amount of aloe-based lotion on their skin to keep it soft and nourished, but always consult with a veterinarian before using any type of lotion on your hamster. If your hamster’s teeth look like they are getting too long, consult with your veterinarian to find methods for shortening their teeth. If you notice any of the above signs in your hamster, contact your veterinarian immediately. Some of the most common illnesses hamsters encounter are diabetes, diarrhea, malocclusion (overgrown teeth), and mites. Keeping some of these hamster care methods in mind, we put together some products that will help you care for your hamster. We want to make sure you are well-informed when choosing the best products for hamster care, so we consulted various sources online and read online reviews to ensure you are being presented with the best information. We mentioned that hamsters love to get their cardio on, but you might not think about how noisy all that wheel running can get, especially if it takes place during the middle of the night. 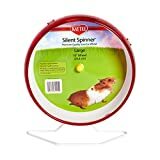 The KAYTEE Silent Spinner Wheel uses ball bearing technology to provide durability and noise control while allowing your hamster to run free whenever they would like. In addition to having a hamster wheel that allows your pet hamster to run whenever they wish, it can also be fun to let them run around in a hamster ball. This ball allows you to have a fun interaction with your hamster, as well as promoting healthy exercise. It is safe and secure and could also be used while you are cleaning out the hamster cage or just want to provide some extra running room. If you purchase it through the Petsmart website, it also includes a treat stick for your pet hamster to enjoy. This hamster cage comes equipped with a balcony and plenty of running space to care for your hamster. 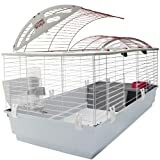 Any hamster cage you purchase should be at least 15 inches long by 12 inches high, but the larger the better, as this will simply provide more space for your hamster to play. 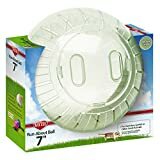 Deep bottom tray – This feature ensures that the hamster’s bedding will not get pushed out of the cage, as well as making for a more comfortable bed for your hamster. When it comes time to clean the cage, you will want to discard all bedding, followed by washing the cage with soap and warm water. If you decide to use any type of cleaning solution, such as vinegar, make sure you thoroughly wash and dry the cage before returning your hamster to it, so they do not inhale any of the remnants. It is important to provide your hamster with proper nutrition to keep them feeling their best. Always make sure your hamster has access to fresh food and water and change it out daily to keep it fresh. Even if they did not finish drinking all their water or eating all their food, it should be swapped out for fresh food and water. 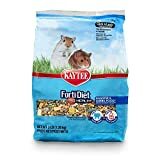 The Kaytee Forti Diet Pro Health Hamster food contains only natural ingredients, as well as pre and probiotics that ensure your hamster’s digestion is running smoothly. As previously mentioned, hamsters tend to commonly suffer from diarrhea, so it is vital to keep an eye on their digestion and make sure they are getting enough fibrous foods in their diet. It also contains various textures to help clean and grind down your hamster’s teeth, which is necessary for their health. A properly balanced diet for hamsters includes grains, vegetables, and fruits, as well as clean water that is refreshed daily. Hamsters should never be fed chocolate, caffeine, alcohol, sugar, or high-fat foods. If a hamster does not eat fruit and vegetables that are put into their cage within 24 hours, it should be removed from the cage to prevent rotting. This toy is perfect to ensure that your hamster has the textures they need to chew on for their teeth health. 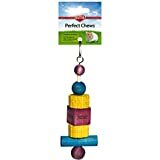 It contains various wood blocks on a chain that will provide hours of chew time and can then be removed once they have been chewed down. This ensures that you do not have to keep small, ground down pieces and can easily discard them. This paper bedding is super soft and absorbent and will make for a comfortable bed for your hamster. 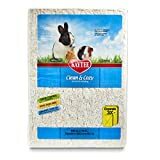 It has an odor control guarantee and will absorb over two times more liquid than other brands of hamster bedding, as well as being dust-free, which will make for a cleaner environment. As a general rule, hamster bedding should not be made of wood shavings, as this can cause respiratory issues in hamsters. You should look for bedding that is made from cellulose or plant-based paper fibers to ensure it is the healthiest material for them. You should also avoid using newspaper shavings or scented paper to avoid causing any respiratory issues. Make sure you discard all bedding when cleaning out your hamster’s cage, rather than trying to clean portions of the bedding. It is more sanitary to throw it away and start fresh. One final tip to remember regarding bedding is to use about one to two inches of bedding to provide the ultimate comfort for your hamster. It is important to have a spot in your hamster cage where your hamster can hide, as they like to nest and have a darker area to rest, especially if you are moving them into a new environment. 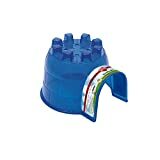 This durable igloo will provide a perfect hiding spot for your hamster and can fit perfectly in any section of the cage. The material on the igloo is also transparent enough that you can spot your hamster while they are hiding inside. It is odor and stain-resistant, along with air vents on the side to keep your hamster healthy and give them the best care. Hamsters require a lot of care and attention to keep them happy and healthy, but they also tend to care for themselves in a lot of ways. They know what they need and as long as you provide them the right tools and equipment, they can typically keep things going and keep themselves entertained. It is vital to remember to keep up with veterinarian visits to ensure they are feeling well and have everything they need. Each of the hamster care products above will help ensure your hamster is getting enough exercise, the proper nutrition, and the right amount of interaction to keep them happy.